This is something I hear a lot. It makes me sad, but not surprised. There are a lot of easier things to do these days. Tap your phone for a quick hit of dopamine. Check to see if someone liked your post or pic. Check your mail. Scroll through ‘The Stream’. It’s a pity - because as personalised search takes over, we’re going to start seeing more and more of the same thing. As Google & Facebook track your activity, they’re going to start serving up stuff that they think you’ll like. In other words, soon enough we’ll all be living in confirmation bias bubbles. Worlds that reflect our own ideas of life and what’s right back at us. “If you like this, you might like these articles / tracks / videos” referrals can be useful but they also herald the beginning of an unparalleled cultural myopia. The more we ‘like’ these view points, the more they’ll be shown to us. And on it will go. This intellectual future is the opposite of stimulating. It’s the opposite of growth, and is discussed in length in this article by Zygmunt Bauman. This is usually the excuse for not reading fiction. It’s a similar excuse many make not to exercise. And there are parallels. Fiction is like exercise for the mind: it poses hypothetical situations and - without telling you how to think - allows you to grow intellectually and emotionally, because you draw your own conclusions about right and wrong. It helps you develop empathy and imagination, by helping you understand different points of view. Through empathy it challenges ideas you may have had about the status quo, and it broadens your mind. It allows you to understand people and places that aren't familiar to you. It also helps you realise that whatever you're going through, you're not alone in the world. And most importantly, it encourages dreaming. In a world where everything seems to be going wrong, stories, dreaming and empathy seem more important now than ever before. We need to cultivate a spiritual and empathetic fitness if we are - all fifteen billion of us - going to figure out a way to live in relative peace together on this planet. "Fiction is like exercise for the mind: it poses hypothetical situations and - without telling you how to think - allows you to grow intellectually and emotionally, because you draw your own conclusions about right and wrong. It helps you develop empathy and imagination, by helping you understand different points of view." I do believe we live in a time where we need our artists more than ever, but we appreciate art less than we ever have. Instead, we process our art, make it palatable, attach it to brands. But artists - being the instinctively disruptive and curious among us - help us transcend the cultural and social barriers that are responsible for so many of the issues we face as humans trying to live together peacefully while we fight for increasingly-scarce resources. And while our STEM professions are invaluable - they have alerted us, after all, to the fact that the earth is running out of resources - we need to develop our emotional, intellectual and ethical resources now, quite simply, to survive. Through art we find emotional common ground; we find out we're the same, after all. For a great video on this topic, watch screenwriting guru Robert McKee talk about the role of the artist in modern times here. A good piece of fiction will do just that, and more. It’ll do it while entertaining you, while engaging both sides of your brain. It won’t give you a ready-made list of opinions that you should adopt, or actions to follow - it does one better. It gives you the ability to discern for yourself how to form opinions, how to judge words against actions, how to understand people through character development. Stories and characters contain the subconscious archetypal blueprints for human psychology - read enough and you’ll see all your favourite characters and narrative arcs play out in life around you. Read enough and you’ll find that the world becomes less unpredictable, people less difficult to understand, struggles less hard to overcome. Fiction teaches you about yourself. Whether you love a book or you hate a book, an emotional reaction always reveals something about you. It brings you back to your truth. This is something an essay or an instructional manual can’t always deliver, because they tell you how to think. Us humans don’t love being told what to do. Our brains are made for play, for enjoyment. Multiple studies have shown that we learn better when we’re playing than through instruction. Fiction engages the rational mind in play. Learning happens when we read fiction, just not the way ‘learning’ is packaged to the masses today. I, too, am guilty of struggling to find time to read fiction. Mostly I feel guilty because I should be writing it. And, of course, social media. But I made time for it the way I make time for exercise. I see it as ‘brain investment time’, and thanks to the Kindle, it can now happen anywhere. Waiting for my coffee, eating lunch, a half hour before bed - it all adds up to about 45 minutes a day. Sometimes I even go old school and drag a book around. The reward is that I get the pleasure of consuming content that’s been carefully crafted, as opposed to content that’s been smashed out on someone’s phone, while being spared the incidental trauma of random content, for eg a tactical ad for baked beans. I get the satisfaction of watching a long-form story unfold and seeing a writer’s genius at work, which is more inspiring ultimately than a video compilation of cats whacking dogs on the head (okay only marginally ;). I also get that take-your-breath-away feeling at the end of a good book where you feel like your whole brain’s been turned inside out, and your view on the world will never be the same again - a feeling I have never yet got from anything on the internet. And certainly not from a business motivational book. So there are a few good reasons to make a point of reading fiction. And now if you’ll excuse me, I have to write a scene in which a writer fails to hand in her novel because she’s writing a piece on why we should read fiction. Which I will write right after I watch this video of a cat whacking a dog on the head. 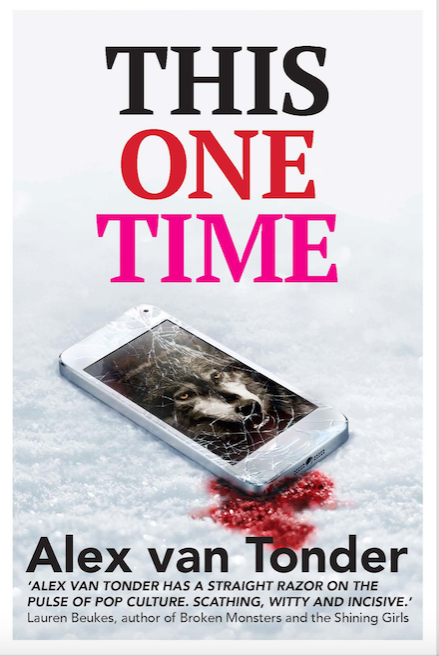 Alex van Tonder is the author of This One Time. Find it on Amazon here or Order it here.